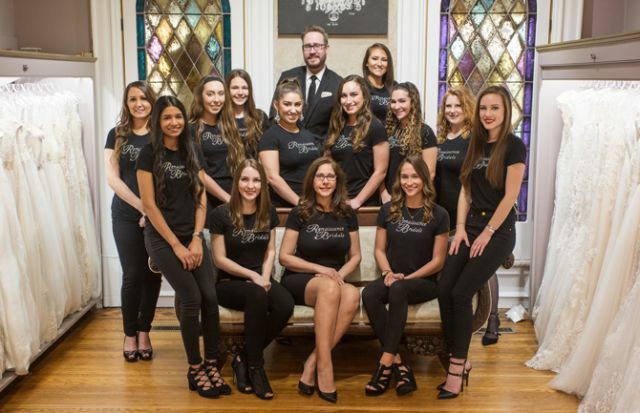 The Renaissance Bridals and Prom team. From little acorns grow mighty oaks. In nature, it’s true. It’s also a reality in the bridal industry. In the fall of 1990, he and his brand-new bride, Beth, took a leap of faith and prepared to open a business selling custom-made wedding gowns in York, Pa. They were young – in their early 20s – and fairly fearless. At the time, opening Renaissance Bridals and Prom just sounded like something fun to do, not to mention it played nicely to their skills and talents. Beth, who’d grown up sewing clothes for herself and friends, had a passion for the craft and a real knack for making beautiful gowns. 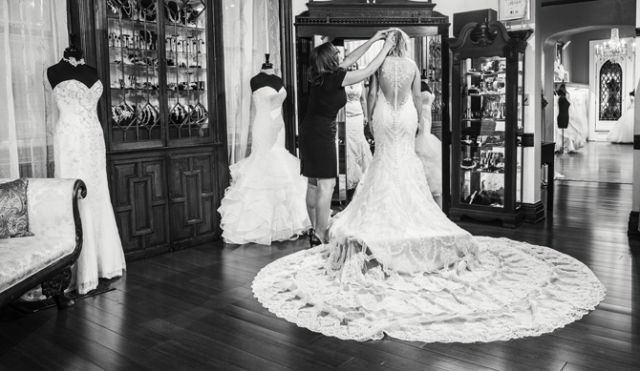 After earning a fashion merchandising degree and contracting to make some custom wedding gowns for a salon in another town, she soon realized was there a market for her designs. More importantly, making and selling them was something she believed she could legitimately do herself, through a business of her own. Jon believed she could, too. In fact, he had his own set of gifts that he felt could support and drive such an entrepreneurial undertaking. Prior to opening the store, he’d been successful in advertising. Visual, artistic and energetic, he felt something in this new venture just spoke to him and who he was. That said, just prior to opening their doors on January 1, 1991, Jon and Beth made a smart, strategic move. 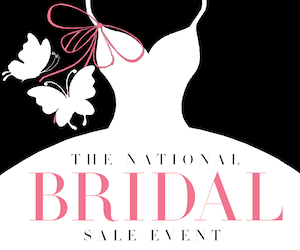 They attended a local bridal show, sharing a quarter of a booth with other vendors and handing out little cards advertising their debuting business. Knowing nothing about gown construction, Jon had decided to focus on doing flowers for people’s cakes. Beth, of course, marketed her custom-made gown business, plus the few gowns they had decided to carry. Clearly specializing in different product niches, Jon says they both had the same clear vision for what they were really selling: fantasy. And their efforts immediately started to pay off. From the start, customers came. From the start, Jon and Beth worked nose to the grindstone. They soon quit all part-time work and moved full time into this new business direction, which they quickly discovered they loved. Always and to their delight, they made choices that ensured they could pay their bills. Jon’s flower business flourished to the point that he soon became the “it person” for floral design in the region. As well, Beth worked tirelessly for her customers, who only grew in number. While steady growth was exciting and exactly what they wanted, within a year of opening shop, the couple realized they’d outgrown their 700-square-foot space. So they moved soon thereafter, choosing an historic building smack in the middle of downtown York. The new location needed a little TLC – which they gave it – but it had a number of innate aesthetic strengths, including an 1860s crystal gasalier (gas chandelier) and a set of massive double doors that opened up majestically to reveal an inspiring space. After the remodel, Beth and Jon started serving wedding parties and prom customers in this new space. They attended markets religiously and, penny wise, often bunked up with friends who lived in New York City, enjoying the glitz and glamour the market events afforded. A few years into the business, when the couple started having children, Jon dropped the flower business and went full force, dedicating himself to developing prom in addition to building out bridal with his wife. 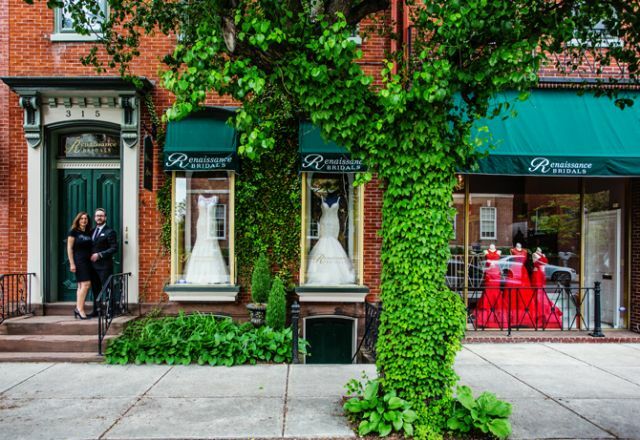 Today the store specializes in bridal, prom and special occasion, however, the couple did do men’s formalwear, shoes and alternations – all of which have since been dropped to better focus on what made the best business sense: brides, mothers, bridesmaids, prom and special occasion wear. 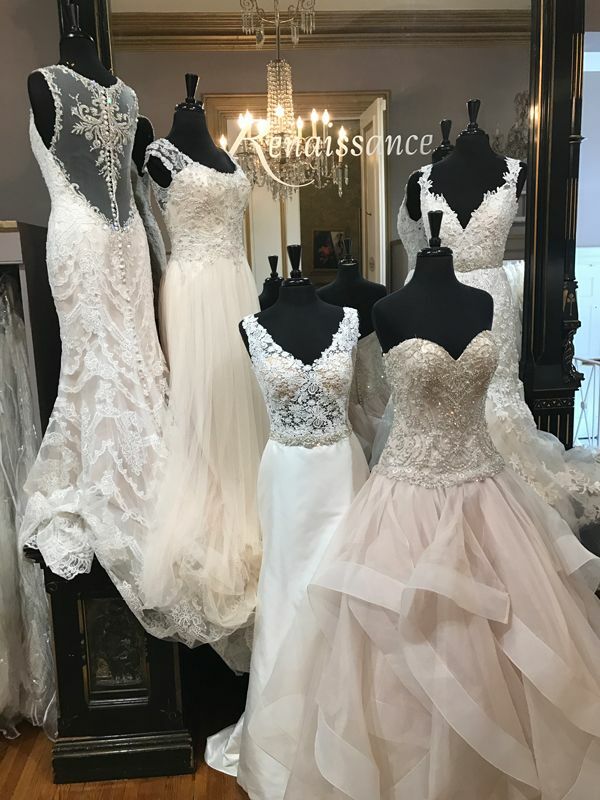 Over time, Renaissance Bridals and Prom has evolved into a destination salon, drawing its market from at least five surrounding states. And yet, just a couple of years ago, a unique opportunity to purchase the building next door came up. The Smiths jumped on it, pulling up carpet to reveal stunning wood floors and conducting a lightning-fast remodel that maintained the integrity of the 1860s architecture yet better departmentalized product categories, supporting greater space and sense of place. The remodel of these two adjoining locations expanded not just their business but also its reputable brand into a dramatic, elegant expanse of three floors within 14,000 square feet. Jon says they’ve taken great care to ensure that while it’s stunning and tasteful, the feeling is incredibly inviting, consistently cheerful, and polished without feeling pompous. Elegant merchandising displays set the stage for total elegance. Handsome young men serve the mothers of prom girls champagne or coffee if they prefer. 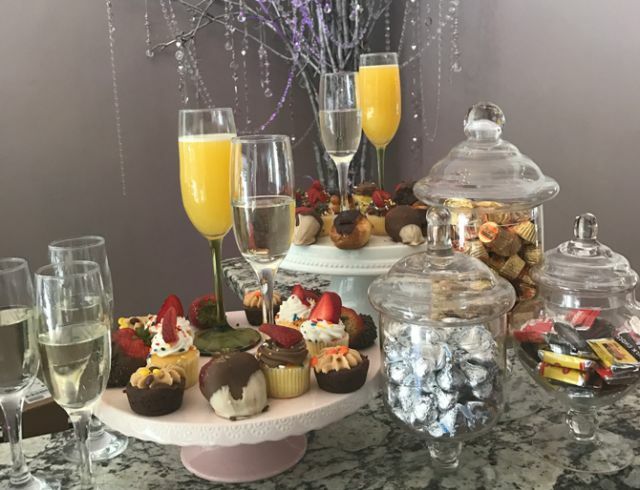 Little touches light up the customer experience, from a table of sweet, delicious treats to the ample dressing rooms that ensure every customer gets her own room not to mention her own personal sales consultant. Speaking of the staff, the Smiths have them wear black shirts with glimmering A/B crystals in the store logo. As well, they also expect sparkle in the eyes of every sales consultant, who must maintain high standards of energy, personal hygiene, manners and customer engagement. Since the store’s beginning, Jon says that business has been better year over year even when times have been tough for other retailers, including competitors. Some of the earlier success he attributes to the fact that he and his wife were the same age as their customers, or on the same “page” of those getting married. The Smiths simply understood their customers’ mindset, wishes and needs. This translated into making a lot of good decisions around product and service. In short, they demonstrated that they “got” their customers – and customers rewarded them, becoming loyal to the brand and speaking highly about Renaissance to their friends and family. Not missing a beat and always believing in themselves, the couple stuck to their guns when it came to the styles and brands they carried. With Beth’s expertise in fashion and gown construction, they knew a good gown from a bad one. And yet Jon recalls some growing pains relative to the occasional troublesome sales rep who would attempt to get them to buy against their will. In particular, Jon had to shut down one particularly pushy rep who said he’d take his line to their competitor if Jon didn’t buy it. However, not only did Jon not want to carry the line or support this high-pressure relationship but he also knew his numbers. Buying into the line could potentially bankrupt the business – a risk the Smiths were not willing to take. The sales rep continued his antics until the couple put their foot down and told him he was not welcome in their store and to stop calling. Meanwhile, Jon and Beth focused their resources on lines they knew they could sell. And they also chose professional partners who respected their business acumen and genuinely wanted to see their store succeed. 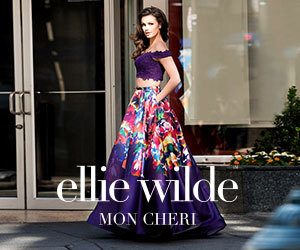 One such designer was Jovani. To this day, that relationship, built on mutual support and strong ethics, has benefited both companies. In fact, Renaissance recently shared with its staff that they are among the Top-30 of Jovani’s 1,700 accounts. In addition, Jon says another, undeniable reason for why the journey has been amazing is because he and Beth have been able to share it with their children. The parents of three daughters, the Smiths raised their girls while building up their business. 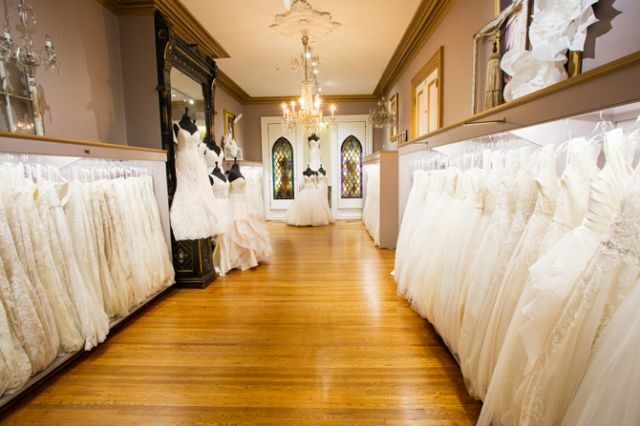 Now in their teens and early 20s, their children have been involved in both the store and the wedding industry to varying degrees. For example, when Jon began taking his two oldest daughters to market, they witnessed first hand all the behind-the-scenes aspects of the industry. There, their daughters would trek alongside their parents, going to the various designer showrooms, studios, fashion shows and events, only to return to the hotel room at the evening’s end and watch their father crunch numbers and make buying decisions all night. Looking back, Jon says exposure to all this taught their girls why grit and work ethic matter. For example, while at market, they got a front-seat row to see how Jon and Beth came to earn the respect of designers, manufacturers, sales reps and fellow retailers in their trade. As the girls got older, Jon also learned to value his daughters’ opinions on fashion, turning to them for input when buying for prom, for example. Currently, his eldest daughter, Madeline, has been making her own mark in the industry, modeling professionally for major companies, including prom designers for the past six years. As retailers, with almost three decades of profitable business ownership in the books and a plethora of “best of” awards to their name, the Smiths say that, today, their most vital goal is to sustain what they’ve created. With a more veteran business that’s only gotten bigger and better, there’s a lot more at stake, and this comes with its own pressures for performance. But Jon says they’re up to the challenge, which is why he swears to never put his head in the sand, thinking they don’t need to learn new strategies for keeping their business performing and on the forefront of its industry. After all, times have changed. Regardless of whether he’s a fan of social media, he’s got to do it well to connect with customers and market the business. He’s also got to focus on what he and Beth can control. They realize there’s little they can personally do to impact what happens with online sales, the economy, or the global consumer marketplace. To them, it’s all a bit of a puzzle that everyone who cares about the industry is trying to understand and solve as best they can. So when he and Beth are asked to share perspectives with or give feedback to trusted industry partners, they do. They collaborate when they can, believing their piece of the puzzle matters in spite of not always knowing the answers.